Category: $5,001 - $10,000, Cape Cod, Cape Cod Series - On Sale, Combination Poly/Glass Greenhouses, Feature Greenhouses On Sale, Free Standing Greenhouses, Single Glass Greenhouses, More.. This Cape Cod Feature Glass Greenhouse boasts an aesthetically appealing high peak roof designed at a 45 degree angle, providing spacious headroom for hanging baskets and taller plants. During winter months the roof will also shed snow more readily allowing maximum sunlight to enter the greenhouse. These glass greenhouses are an architectural delight and are sure to create a stunning focal point in any garden setting. This glass greenhouse allows you to choose a tempered safety glass or 6mm twin wall polycarbonate roof. 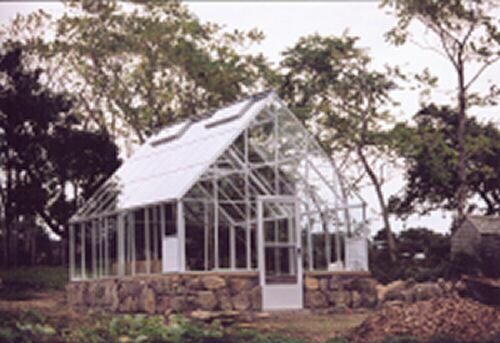 Please call for pricing on double glass, twinwall or five wall polycarbonate greenhouses. Built to withstand harsh weather conditions, the heavy durable aluminum greenhouses come with an attractive white enamel paint finish. The proven performance of a glass greenhouse covering is guaranteed to provide many hours of gardening enjoyment year-round. Large automatic roof vents provide air circulation and the standard storm/screen door comes with a key lock. Various door upgrades available. Height to center peak is 12' 2 1/2"
4 Roof Vents Measuring 20" x 48"
Your choice of tempered glass roof or twin wall polycarbonate roof. White is the standard paint color. To choose green or brown paint finishes, select from the Options Box below.